I don't do a lot of car work. Just a little each year. This is the first time I've done a retrofit enhancement. It's not as perfect as it could be but it's right. Here are some things I've learned in the process. 1. When making the cut-out in the fascia I found it easier to do so after the fascia is removed. I used my jigsaw with downward facing teeth for a clean cut. Keep the blade running fast but move the saw slowly and patiently. Also, clamp down the back surface of the fascia to something solid to keep it from vibrating. 2. If (when) the fascia retaining studs come out of the fascia they may not screw back in by turning the nut. What happened to me was that the nut would turn then tighten down so that stud would not go back into the fascia. Instead I gripped the stud with a vise grip and removed the nut from its post. Then the stud was screwed back into the fascia. Finally the nut can be placed back on the stud and the fascia pulled back to the body where it should be. 3. If your Jeep, like mine, has spent its life outside then you may face a corrosion issue. Keep a bolt remover handy. They can save a lot of headaches. 4. You'll find a white plastic spring clip toward the back of each side of the fascia. To keep it from pulling the metal out unnecessarily, use a long needle-nose plier to reach in and compress it for simpler removal. I also put a rag over it to keep from scratching visible body paint. 5. Depending on your vehicle's weather exposure you might consider purchasing (or going to a yard for them cheap) some additional of the retainers that go across the top back of the fascia. The plastic may crack and break when you remove them. Better to spend a dollar or two in advance. Cheap insurance. Of course you can pick them up at any time and the top ones are easy to get to for subsequent work. 6. If you're working in your driveway consider wheel removal when you replace the rear splash guards. Unless you have two floor jacks (I don't) you'll spend a lot of time going back and forth. Did the exact upgrade to mine about a year ago, and I also grabbed the factory wiring to the hitch from the same junkyard vehicle that I got the hitch from. The wiring simply plugs into the existing harness on the driver's side, over the left rear wheel. Great upgrade! Thanks for the tips CBrendemuehl. Curious where you bought your OE hitch since it looks new and where did you get the bezel? I haven't been too successful finding either online at a pick-n-pull. I've seen a new bezel online which is really overpriced at $70. Nearest jy to me is 20+ miles away. Thanks. The hitches are on eBay for about $75. The MOPAR rear fascia/bezel CBXTN473AA is also on eBay for < $30. 7. The rivots for re-attaching the splash guards can be a real pain without the tool. And I didn't want to by a tool for a single use. So I came up with a method. Since the method is to pull the pin to spread the back, what you need to do is hold the base in place while you pull the pin. My solution was to grip the pin with a vise grip and leave about 1/8" gap at the base. Then I would slide a needle-nose plier beneath the vise grip to pull it back. The bevel of the needle nose would pull the pin out. After getting to the highest part of the plier I would pull it back, grab down further with the vise grip, and repeat the process. Takes about 3 or for passes to pull it out all the way for a tight fit. The cut off with diagonal cutters. Or break off. Whatever pleases you. As long as the base is holding tight. Thanks and I've found all those parts while appreciate the part numbers. I should have opened the TSB first and see that they're at the beginning. Guess one thing which has been throwing me for a loop is I've searched out the OE hitch for the WJ with the Mopar part number 82213553 which is around $300. And I would not doubt they are substituting the hitch in the TSB while charging a higher price. I haven't been able to find any reviews/info on that CBXN471AA hitch in the TSB you bought/used. That is a 2"x2" receiver is it not and is there any type of category (III or IV) or rating like 5K or 6.5K on that hitch? Was just curious and since my trailer is small I likely wouldn't need a heavier duty hitch unless I rented a larger trailer for hauling. Thanks for all the info! Hitch part # is CBXTN471AA. Look for that on eBay. There are two used ones at my local yard but I have this thing about old hitches. Just me. It's a Class 3 hitch so you can pull some big stuff. Yeah, I already found that CBXTN471AA hitch on ebay and great price at $75 w/free shipping! 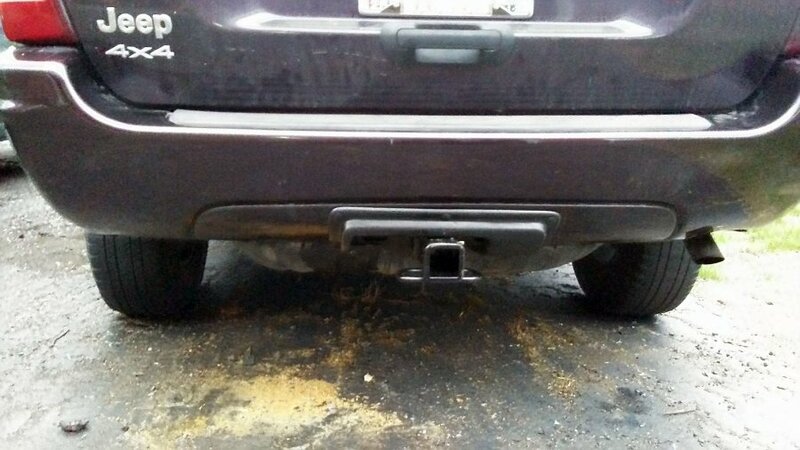 Also real good tip on finding those hitch to skid plate braces at bamwholesaleparts.com since they were a little difficult to find. Real good to know it's class 3 hitch and thanks for all the info! PS. Since I live in the woods now if I could just keep the cursed squirrels and mice from chewing the wires on my trailer! I may end up covering the wires with the stainless brake line coil protectors or using conduit. Just thought I'd mention I did order all the parts including new hitch kit, bezel kit and braces from hitch to tank skid last Friday. They should be here within the next 10-days. Thanks again for the part numbers and help. Since my 04 4.7 didn't come with any of the tow package options I also ordered the below wire harness with module which should be plug-n-play. My small trailer only has the flat 4-pin connector like the one on the harness. Good video on the bottom of the link page showing the harness install.